When originally designed, the M1 carbine was intended to have only selective-fire capabilities. When actual production on the gun began, the decision was made to not include that feature. Full automatic fire capabilities were included in the design of the M2 carbine, an upgraded selective-fire version of the M1 released in 1944. The M2 included improvements to the rear sight, the addition of a bayonet lug and other improvements off of the M1 design. This is a late WWII M1 Carbine as manufactured by Winchester that was subsequently converted to the fully automatic M2 configuration. The upgrade was considered a success, however, there were tradeoffs. The M2 included a heavier 30-round magazine which put greater strain on the magazine catch. This necessitated the development of a studier catch. This further required a modification on the slide, sear and stock. When engaged in full automatic fire, the T4 model could shoot off 750 rounds a minute while generating a manageable recoil. While many carbines were manufactured as M2s the only real difference between the M1 and M2s was the fire control group they belonged to. The military issued soldiers field conversion kits (T17 and T18) to easily convert M1s into serviceable M2s. 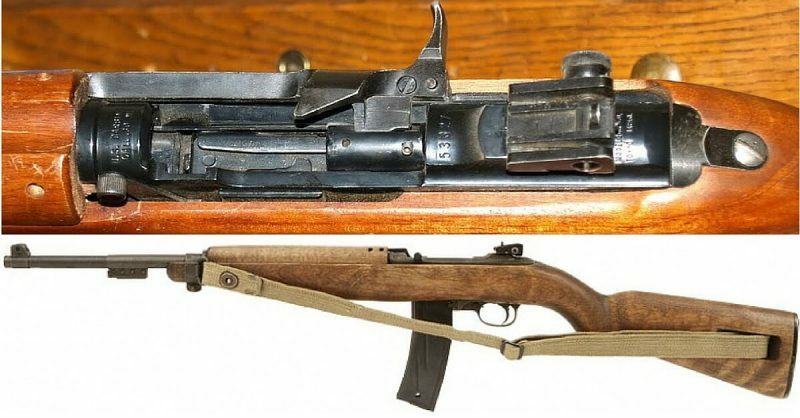 History looks back upon the M2 carbine as an anomaly of sorts. Historians to this day debate and struggle as to how best categorize the M2 carbine. More powerful than a submachine gun, it can be considered an assault rifle, despite it firing projectiles considerably less powerful than the StG 44’s 7.92×33mm Kurz. Conversely, the M2 can also be considered a precursor to the modern personal defense weapon (PDW), even though contemporary guns in that category, like the FN P90, fire substantially different cartridges like the 5.7×28mm.